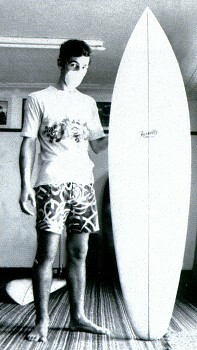 1970 Farrelly Diamond tail 6 ft 3 1/2"
Foam blank with 1/8 inch plywood stringer, clear volan laminate with 1/2 inch rail lap. Foil deck to tail patch. 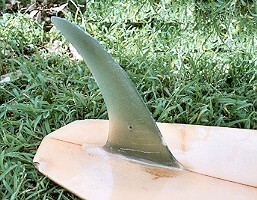 Fin patch. 9 3/4 inch x 6 inch base @ 5 inches. With stamped serial number, 1902. 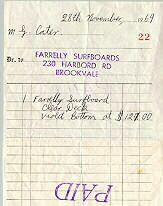 Board found next to rubbish bin, Gerroa Beach Tourist Park, by Nick De Jong, February 2003.